Muto 2010 Limited - Coach or Mentor? A coach seeks to help someone, typically a subordinate, to focus on specific goals and encouraging and support them in working out how to achieve those goals. Coaching activity is usually a short term, skills specific development intervention. The coach should provide constructive feedback to the learner throughout the process. By contrast, mentoring is a two-way learning relationship; it is concerned with developing the overall capabilities of the mentee (or learner), and also provides learning and development for the mentor. It supports the mentee by helping to unlock their potential and also in determining which goals to pursue and why. A mentor seeks to build wisdom over an extended period of time – the ability to apply skills, knowledge and experience in new situations and to new problems. Mentors can not only be considered as “sounding boards” but can be viewed as role models to their learners. 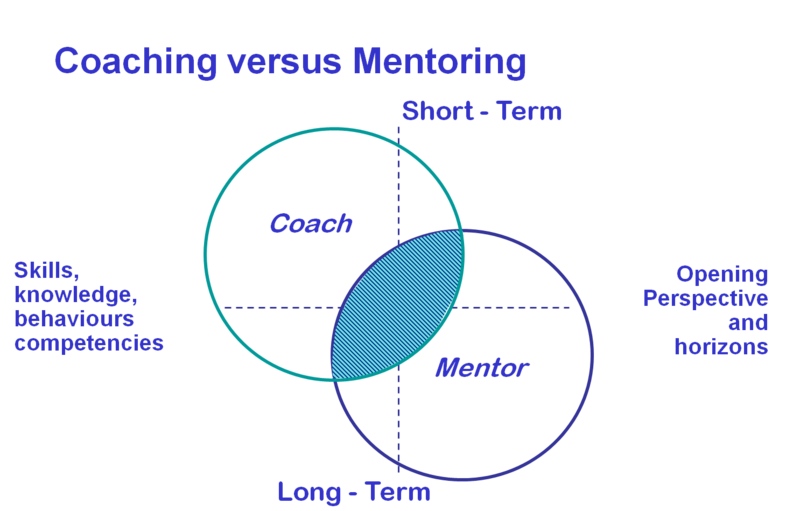 One distinct difference between coaching and mentoring (an important boundary) is that whereas a coach may typically be the learner’s line manager, in a mentoring relationship a line manager would not mentor his direct reports. The following model shows the high level view of coach focus versus mentor focus; this model was developed by Clutterbuck Associates, and sets the general context of the coach and mentor relationship.